(Photo: NCCI)Christians from the National Council of Churches in India and Muslims who met the Heiner Bielefeldt, the United Nations Special Rapporteur on Freedom of Religion or Belief on February 26, 2014. They told him how Christian and Muslim Dalits face discrimination compared to Dalits from the Hindu majority. India's Dalits were once known as untouchables in the days when the caste system had no laws against it. Although the federal government has tried to give Dalits a lift-up with affirmative action legislation, some Dalits says they are more untouchable than Dalitis from the Hindu majority. These are Christian and Muslim Dalits. Human Rights Watch in 2007 entitled the situation for Dalits: "India: 'Hidden Apartheid' of Discrimination Against Dalits." National Council of Churches in India (NCCI) member churches expressed deep concern over discrimination faced by Christian and Muslim Dalit communities in their country after a meeting they organized on Wednesday. The churches, which belong to the World Council of Churches, were, demanding protection of the right to freedom of religion in a meeting with Heiner Bielefeldt, the United Nations Special Rapporteur on Freedom of Religion or Belief. "Both Dalit Christians and Dalit Muslim are not considered Dalits by our government, and hence, they are denied affirmative action programmes that empower marginalized communities," said Samuel Jayakumar, the NCCI's executive secretary for the Commission on Policy, Governance and Public Witness, who chaired the meeting. "We see this as religion based discrimination against Christian and Muslim Dalits in India," he said. Their meeting took place while pollsters were predicting a sweeping national election win in two months time for the Bharatiya Janata Party (BJP), which some of its opponents say has a "Hindu nationalist" agenda. Father Z. Devasagayaraj of the Catholic Bishops Conference of India said that Dalit Christians and Dalit Muslims are denied affirmative action programmes to which they are entitled in education and employment. He too cited examples of the difficulties these communities face as they do not come under the legal prevention of atrocities act; they do not have access to special programs of the government for Dalits; nor can they contest in certain elections. Due to all this the development of the community has been seriously affected. The meeting was attended by church leaders, human rights activists, lawyers, academics, leaders of the Muslim community and representatives of the Catholic Bishops Conference of India, and was organized by the National Council of Churches in India (NCCI). 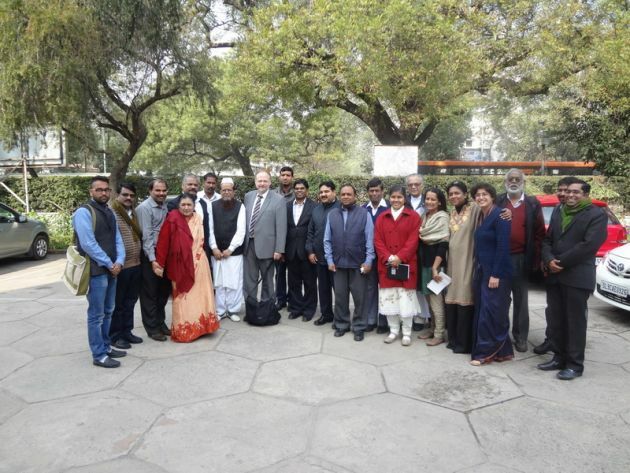 Bielefeldt was visiting India until February 27 invited by civil society organizations including the Indian Social Institute and Jawaharlal Nehru University in New Delhi. The NCCI said that Ramesh Nathan from the National Campaign on Dalit Human Rights spoke about numerous forms of "untouchability" resulting from the caste system practiced in India. Nathan noted that Dalit Christians are most vulnerable to caste-based violence but are not protected by the Prevention of Atrocities Act in the Indian constitution, which is meant to prevent atrocities against the scheduled castes, one of the classifications of Dalits. The Indian constitution includes Dalits in the list of scheduled castes as the most marginalized communities who need protection. However when converted to Christianity or Islam, these individuals and communities are excluded from the protective and affirmative measures offered by the Indian government. Leila Passah, general secretary of the Young Women's Christian Association (YWCA) of India also raised with the Special Rapporteur the "inhumane treatment meted out to the Dalit community by the Indian police, when they organized a peaceful protest in Delhi." Passah said, "The police beat up protestors with sticks as Christian and Muslim leaders marched towards the Parliament House to hand over to the prime minster of India a memorandum of demands." Media reports said some 30 people were injured in this incident and several protestors including church leaders were detained in a police station on December 11. Bielefeldt said he recognized issues of discrimination against Dalits in India, calling religious conversion a test case for freedom of religion. He noted that the right to equality has been denied to the Dalit community in India and they cannot be forced to follow a particular religion.